Last week, we published an in-depth piece on the digital entertainment boom gaining momentum on the continent. Africa has over 300 million internet users and counting and with the decreasing price of smartphones, the increase in data consumption has been immense - enter the digital entertainment explosion. 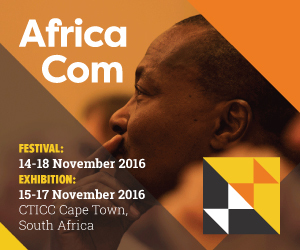 This year's AfricaCom, taking place between the 14-18 November 2016, will be showcasing all the latest trends in African digital entertainment. The Digital Entertainment stream on the 15 November will comprise of Key Note Panels and discussions around the explosion in digital entertainment services, looking at the sectors of gaming, music and video streaming. Some of the key speakers include MTN's Vikash Barath, PWC's Vicki Myburgh, Deezer's Gillian Ezra, Tuluntulu's Pierre van der Hoven and Nichestreem's Catherine Luckhoff. To find out more about the largest tech and telco event in Africa and book you tickets, click here.